Is it even possible for chunky little toddlers that plant tiny kisses on our cheeks to develop bad habits? They squeeze us oh-so-tight and look in absolute wonder as a butterfly softly lands on a blooming flower. Despite absolute cuteness and sweet innocence, they’re still people — just in a smaller, cuter form. And sometimes we needs someone to come and guide us through our mess-ups. And has some life wisdom to offer. And that’s exactly where mommy and daddy come in! 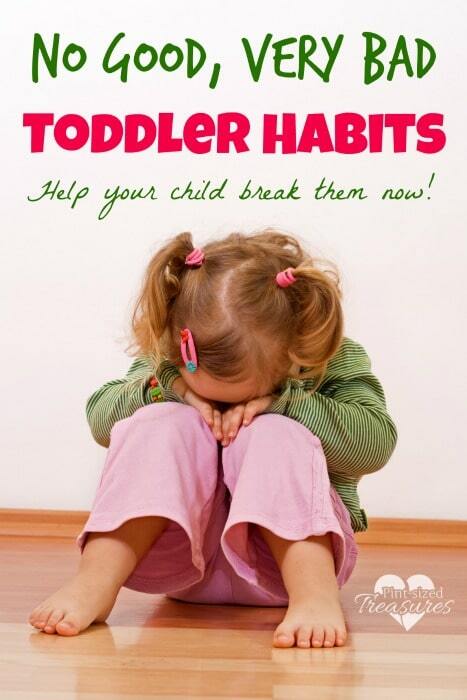 There are some no good, very bad toddler habits that we as moms need to watch out for — and break — before it’s too late. With my first child, I was oblivious to these toddler habits. I was a brand new, very young mom and had a lot to learn. I had been in a conversation with a few friends at church, said good-bye and walked to the car with my husband. “We need to talk about Joshua,” my husband stated. Hmmm….why would we need to talk about our adorable toddler? “Ok, sure. Let’s talk.” I replied with confusion. We had a 20 minute drive, so there was lots of time to talk. “Some friends noticed some negative behavior in Joshua tonight,” my husband began. I sat in silence with my thoughts. Hmmm…oh, yeah. I remember that. Yeah, I do that too. But, is that so bad? “Our friends just wanted to help and said that they would recommend teaching him to respect other people’s things and conversations — even as a toddler. What do you think?” my husband glanced at me for a reply. Wow, I never thought of those things. Everyone called my son good because he never hits, bites and rarely throws temper tantrums…but, wow those were undesirable traits. But my son was oblivious that this behavior wasn’t acceptable. I had never taught him it wasn’t! Honestly, at first I was offended. Do you ever respond that way too? A well-meaning friend, relative or even stranger tries to give you a little bit of advice, and immediately you act like a wounded kitty-cat. You retreat to a corner and hiss and claw at anyone that comes your way. I wanted to defend myself because I thought my mothering skills were being “judged” ever-so-critically. But after a few minutes of calming down and really considering the source, I knew that our friends really had no motive except to see me excel at this motherhood thing. They had been around the parenting bend and knew quite a bit more than me. I was just beginning to spread my wings as a mom. And then I made a decision. I was going to act on their advice and see what happened. It didn’t take long to try it out. In just a little bit, my son grabbed my necklace. He looked shocked — and rightly so. Until that moment, he was allowed to grab anything of mine without reproof — and now I was telling him no. But, he immediately tried again. I responded firmly and consistently…over, and over and over again. It took days, weeks and even months to begin undoing those toddler habits that I had never addressed before. However, as I consistently laid down the rules in a kind and firm way, my toddler gained some manners and finally stopped the bad habits. Sometimes with the busyness of our mommy days we tend to overlook negative behavior. But then,thatnegative behavior becomes habitual. Sometimes it takes an outsider to point out the bad habits in order for us to reevalute our child’s behavior. 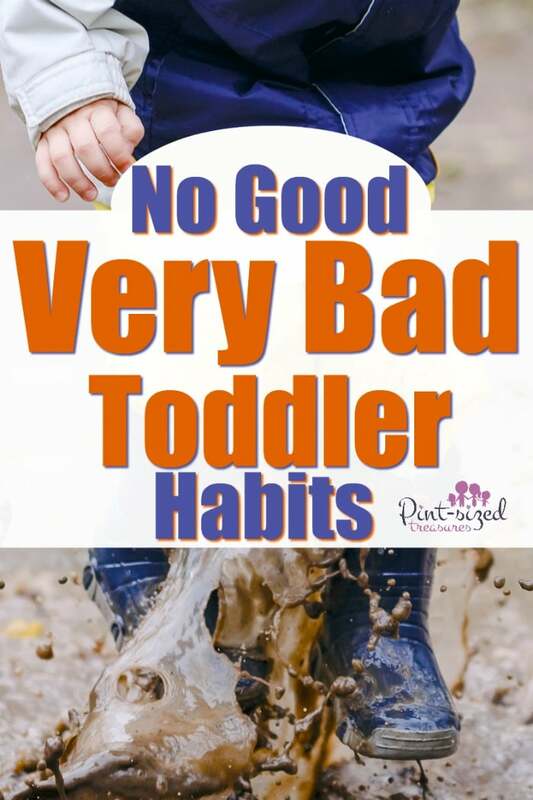 Take a few minutes and ponder this list to see if there are any bad habits in your toddler’s life that you can help change! Grabbing personal possessions. Each toddler is different. The most common items that toddlers are attracted to are jewelry, glasses, phones, keys, purses and diaper bags. Whichever items your toddler is attracted to will be the ones he’ll grab — over and over again. Sure toddlers are cute, and they are learning and exploring, but they need to learn there are boundaries. They simply cannot start digging in the woman’s purse beside you at the doctor’s office. Teach them to respect other people’s things are hands-off. Interrupting adults. My kiddos love to talk. It seems someone is always chattering. Sometimes I have to say, “OK, no one talks for 15 minutes,” just so we can have a few moments of quiet time. I whole-heartedly encourage communication, but even toddlers can learn to wait their turn to talk. Don’t being a long conversation with them or they will continue to interrupt — through their preschool and tween years. We are learning this interrupt rule right now, and my kids love it. It’s respectful for both mom and child! Eating other people’s food. Have you ever been sitting at the table and had your muffin snatched by a toddler? Sitting down to a family meal is a great teaching opportunity for table manners. During yourfamilymeals have yourchildpractice eating from his, and only his plate. If he’s allowed to grab food off your plate, then off dad’s, then off his sister’s, then why wouldn’t he grab food off a dinner guest’s plate? It’s not your toddler’s fault. Teach your child — with patience and kindness — that the only food he can touch is the food on his very own plate. Throwing items in the house. Watch out for flying blocks! Toddlers love to throw things, don’t they? I remember a family member who came to my house for a visit. She was in our house for about 15 minutes when her 18-month-old son started grabbing blocks and throwing them across the room. She never attempted to tell him not to throw the blocks. We finally had to go outside because of the risk of him damaging the house. Teaching our children that certain behavior is wrong and unacceptable is up to us. I do not expect a toddler to know that throwing blocks is unacceptable, unless his parents teach him that. Do you and your child a favor, and teach him that certain items are not for throwing. Biting, hitting, pushing. In complete honesty, my kids are known for not being hitters and biters — and it’s not because they never did it. Hurting another person is one of the big “no-nos” in our house. Lying, disrespect, biting, hitting, pushing or stealing is definitely some of our major house rules that are immediately dealt with when broken. The very first time anyone of my kids intentionally hurts another person, they face consequences. Here are some creative consequences you can check out! I know it’s tiring to address this common toddler behavior, but if you consistently address it every single time, your child will realize there is no getting around it…and will eventually stop biting, hitting and pushing. Intentionally hurting someone else should be stopped early in life. I honestly believe that if you stop it in toddler-hood, you won’t have to constantly deal with a “trouble-maker” in the years to come! Writing and drawing on walls. Every single one of my kids have done this, and it has been a nightmare. With my youngest two kids I have slacked off in this area. I am sure anyone that has known me for the past 12 years would agree. I don’t know why, but I have. With my oldest four kids I was consistent to address the “writing on the wall” issues. I even had a rule, if they drew on a doll, I would take the doll away for a month. I know that may seem harsh, but after seeing doll after doll being ruined, I needed to take drastic measures. My older four kids stopped drawing on things early in their toddler years. They just stopped six months ago — at age four and five. I was too tired or busy to address their behavior. Ongoing, negative behavior until I buckled down and decided to once again, consistently address their bad habits. Then, and only then, the writing on walls and dolls stopped. Why is writing on walls considered a bad habit? It may seem small now, but children need to learn to take care of things…especially other people’s things. My husband and I pay for the house they’re living in. We invest time and money into creating a comfortable, attractive home. Though I don’t believe my toddlers — or yours — are malicious in their wall art, I do think we still need to encourage them to take care of property. Simple thought, but the message is loud and clear. These are honest, bad habits that some adults still make today! And they could have easily been broken in childhood. How do you break this bad habit? Just keep a closer eye on your toddler. Make cleaning fun, upbeat, but at the same time ensure your child is cleaning up his mess, and you’re not doing all the work. It’s a little lesson that will have a lifetime impact. 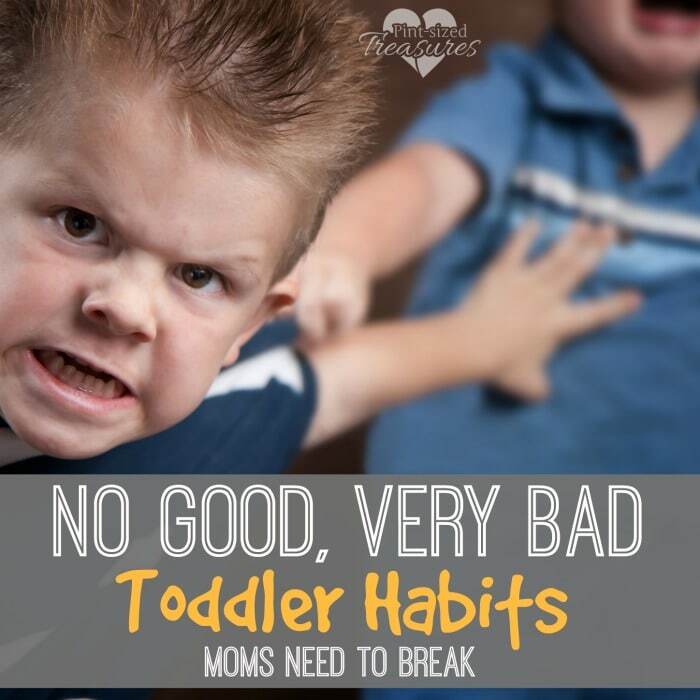 What no good, very bad toddler habits are your working on breaking this week? Don’t worry, moms…your effort will pay off soon! You’ll reap great rewards as you see your toddler develop into a well-mannered preschooler, tween and eventually teen. Start teaching them good behavior — NOW!